Friday Brain Teaser! How is A related to D? Read the riddle carefully and leave your answers in the comment section below. Kindly, explain so others can learn from it. AIs the grand daughter to D.
Chrisluke: A is D's grand child. D is A's grand father. Bunmipaedia: We have "A" to be a Grand daughter to "D", meanwhile " D" is "A" Grandfather. Williams: "D" is the grandfather to "A"
A abd B are sisters, while B-is the daughter of C, then D-is is a father of c, so we should understand that Aand B are of thesame mother, and that there mother is a daughter of D, so the relationship between A and D is that D-is a grandfather of A. A is B's sister and C is B's mother, definitely, C is a mother to two women- A and B. 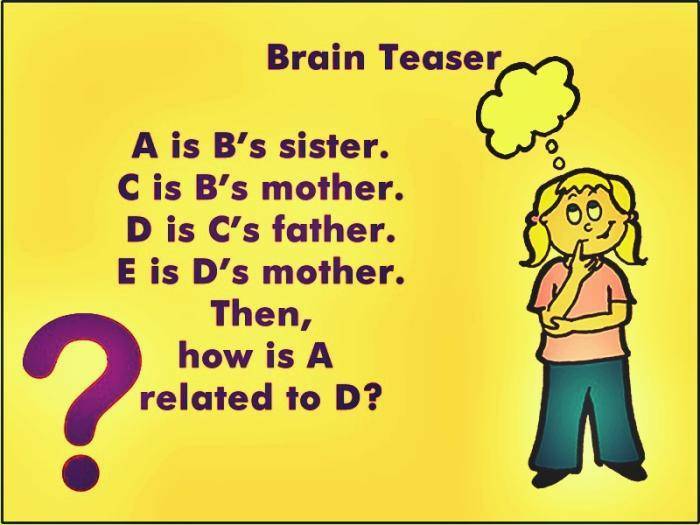 Further more, D is C's father therefore, A is a grand daughter to D. Or D is A's grand father.